Co-Creative Science - Perelandra Ltd.
that are mushrooming all around us. Co-Creative Science is a book about nature and the amazing partnership we can forge with nature for working together to successfully address the many problems that face us in our everyday and professional lives. But co-creative science isn't just for addressing problems. It also points the way for us to establish our new partnership with nature so that we can live an environmentally friendly life that will be part of our planet's solutions and balance, and not part of our planet's problems and destruction. This would be it. 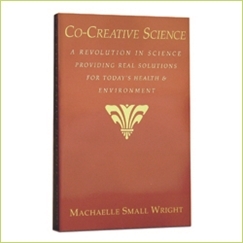 This book not only informs you about Co-Creative Science, it tells you how you can become a Co-Creative Scientist. Should you choose to do this, your life will open up in ways beyond your imagination. You can use this book as a door to another world. A world where the inherent balance of Nature works cooperatively with the evolution of humans for the good of both. Nature Intelligence wants our agreement to work together in co-creative partnership in accordance with the grand design for our universe. This book shows us how to do that.